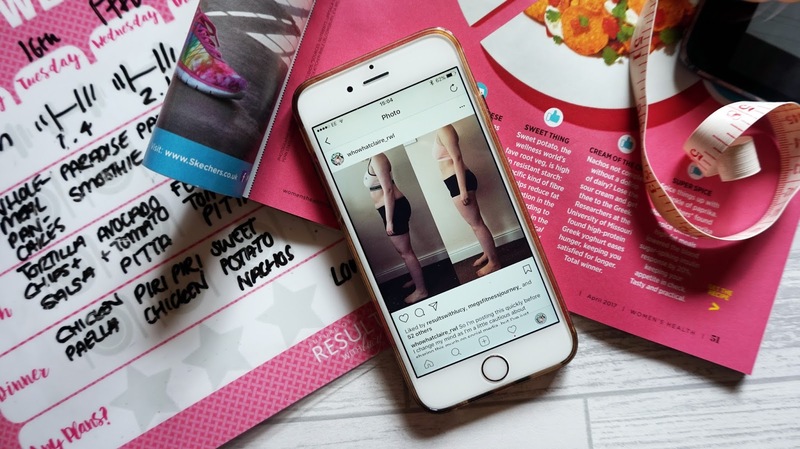 If you’re new to my blog, then you may not know that recently I’ve been doing the Results With Lucy fitness plan as part of the Class of 2017. I’ve actually now come to the end of the first phase of year long plan and wanted to share my results with you! If you’ve been following my health and fitness journey for the past few months then you may have seen my halfway progress post where I showed you the kind of food I’ve been eating, the exercises I’ve been doing and spoke more about the New Beginning plan itself in general. I’d give that one a read if you haven’t already as it will give you a bit of context of what the whole thing is about and how I found the first eight weeks! Now fast forward another 7 weeks or so, and here I am! I’m now a couple of weeks in to the next phase (Wobble To Model), which I’ll talk in more detail about again at the 8 week mark, but for now I really wanted to share my New Beginnings results and give you my thoughts on the first phase as a whole. 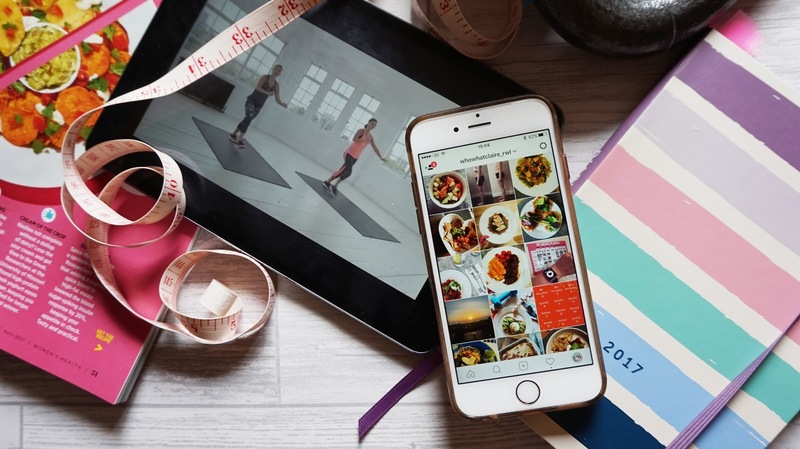 For me, New Beginnings has made a huge change to my life – the way I think about food, the way I approach exercise and how I think about my health, which I think it what the plan is all about. Results With Lucy isn’t a diet, its a change in lifestyle and the whole idea of doing this for such a long time is to introduce that change slowly and let your body and mindset adjust. Since my last post, I’ve had a few ups and downs with the plan. I went on holiday for 12 days back in April and, although I kept up with my workouts by the pool each morning, swapping my weights for a resistance band, after a couple of days my diet started to slip back in to its old ways and old habits that I’d managed to shake off started to creep back in (hello, carbs!). I decided to just give in to temptation because, hey, I was on my holidays and I won’t be abroad again for a while. I’d paid money to be in a gorgeous hot country so why wouldn’t I enjoy the food whilst I was there? Needless to say, I put a few pounds back on and I was actually really upset with this when I got home. This really pushed me back, which it shouldn’t have, because the number on the scales isn’t everything. Admittedly it took me a couple of weeks to get back in to the swing of things with healthy eating, and I have struggled with strength exercises where I’ve reverted back to my dumbells after using a resistance band for a couple of weeks, so my results aren’t as great as I had hoped they would be, but the best thing is, I still saw results!! So many times I have been on holiday, put on a lot of weight and spent forever trying to shift it, but I’m so pleased to say that within a couple of weeks, it’s all back off again. Result! The food is still one of my favourite aspects of the plan, and over the past few weeks I’ve found more recipes that I love and have repeated numerous times. Some of my favourite meals include Ginger & Chilli Chicken, Chicken Paella, Pitta Pizzas, Balsamic Glazed Steak and Oaty Chicken Dippers! You really don’t feel like you’re being deprived of anything because each meal is so tasty, balanced and filling. I’d be lying if I said (other than on holiday) that I’d followed the eating plan 100%. There have been days when all I’ve wanted is a takeaway, but I use the eating out guides to try and pick the healthiest choices. Some days I will crave a packet of crisps or a sweet snack, and I let myself have it, knowing that I’ll be working it off when I get home from work with plenty of cardio and strengh exercises. I don’t deprive myself of anything because I know that 80% of the time I eat well, adopting the 80:20 rule that Results With Lucy’s nutritionist Louise Johnson recommends, where you can treat yourself (in moderation) 20% of the time. Nothing feels too strict and you feel completely in control of your diet without needing to count calories. The other thing I love about the plan is the sheer amount of support you get, not only from the community itself (I’m part of a private Facebook group with the rest of the Class of 2017 members) who constantly help each other out, answer any questions you have or just give you that motivational boost you sometimes need, but also from the Results with Lucy team itself. 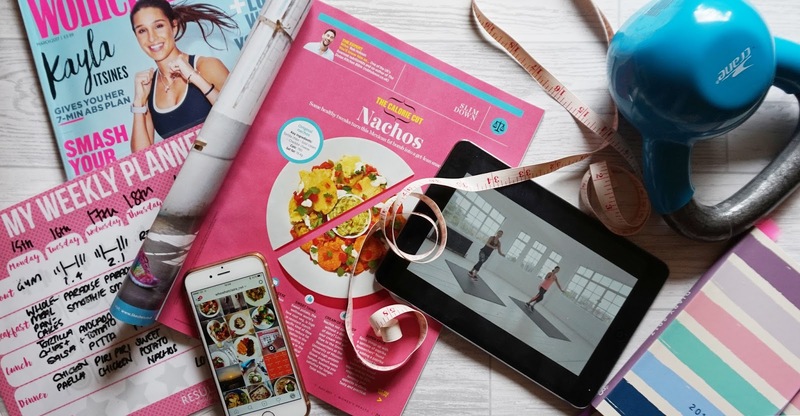 Cecilia Harris, RWL’s main personal trainer is incredibly helpful – she will happily chat on Facebook Messenger to answer your questions, and she holds weekly live chats to give you the support you need to keep at it. 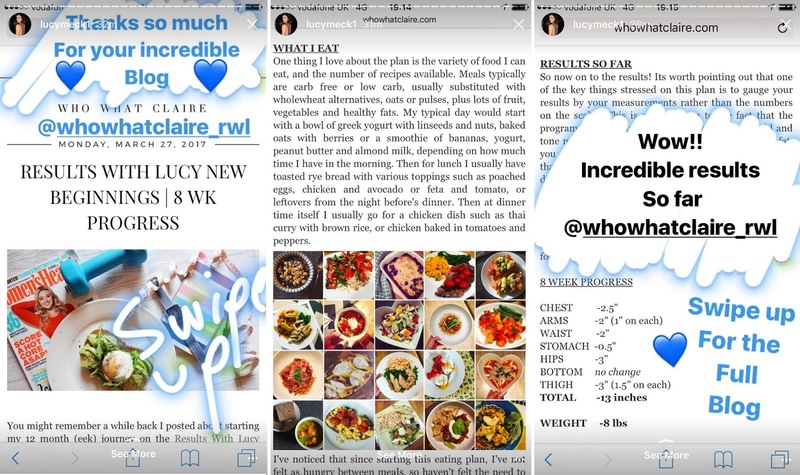 When I wrote my last post, Lucy herself shared it on her Instagram feed and made me feel so proud of what I’d achieved so far, and finally the Results With Lucy ambassadors, girls who have completed the plan in the past and are doing it all over again are there with you all the way. It’s such a fun group of people to be part of! So now on to the numbers. First up you’ll remember that I had to do a fitness test every 4 weeks to help assess how my fitness levels were changing. I won’t bore you with the numbers for every one of these tests, but what I will show you is the difference from week 1 to week 12, which for me is huge!! I’m so pleased with these as it proves to me that I’m getting better, even if sometimes I feel like I can’t do the workouts. I think my biggest achievement here are the press ups. I might not be able to do the full thing yet and still have to rely on my knees to take some of the weight, but my technique is improving! These numbers are only a tiny bit better than my 8 week progress, and in one instance (thighs) I seem to have gained inches, but to still have an overall loss when 2 out of my final 4 weeks were full of unhealthy holiday food is still an achievement for me. If you take a look at my before and after photos (here) you can definitely see a difference – my posture has improved, my waist, stomach and arms are significantly slimmer and I’m starting to see more definition in my legs! If you’re considering having a go at this plan I would whole heartedly recommend it. I, like everyone, have my down days where I feel demotivated and it takes a whole load of effort to work out, but seeing my results written down here makes me feel so proud of what I’ve done so far for my health and for my body, that all I want to do is carry on!